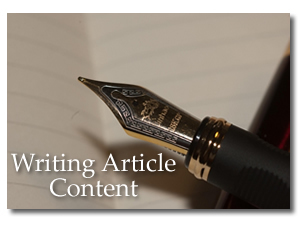 Properly developed content writing ideas are essential for the health of your online business. What is content writing? Basically, I'm just referring to the information (content) that you add to your website or blog. Your site content needs to not only provide the interesting and reliable information your searchers are seeking, but it also needs to be presented in a way that effectively tells the search engines how to rank your article in the search results. During content development, keep in mind when writing article content that your free website content must satisfy several different parties, each of them equally important for you to "get the click!" Who are these parties, and what do I mean by getting the click? There are four parties that must be satisfied - your visitors, the search engines, your merchant partners, and YOU, of course. When this criteria is met... ...click! Your traffic will increase, as well as your relationships, and inevitably your income. How should you classify these aspects of content writing by importance? If you are writing article content just for fun or for your own pleasure, you can pretty much just write whatever pleases you with no thought to anyone else or how/if your content will be viewed on the web. However, when you are trying to build income through content development there's a lot more to it than that. Yes, you can still write what you love (and so you should), but you when developing your initial content writing ideas, you need to please others as well. There are many ways to come up with topics for content writing ideas - magazines, books, newspaper advertisements, conversations with people who enjoy the same subject of your niche, etc. Your visitors – They are the core of your potential website business. Without them your business doesn't exist. Write for them. They will keep coming back if they find what they need. Most web searchers need information about or a solution to a problem they are dealing with. Your article writing (content) has to provide quality information to convince your visitors that you are at least knowledgeable on your subject, if not an expert (even better). The page content that a visitor lands on should let your visitors know that they will find what they are searching for. Otherwise, they simply click the back button to the Search Engine and say "Who's next?" Search Engines are a big part of your business. They want to list only quality results to be delivered to their searchers. Let's say, for example, a Web surfer searches for "Italian pizza." A Search Engine wants to deliver the most relevant "Italian pizza" information on the Net. Don’t try to trick the search engines with false or copied content because this will harm your site sooner or later. Google tweaks their algorithms regularly to eliminate poor results from their listings and allow the cream to rise to the top. This is to your advantage if you are developing your content writing ideas in a way that allows you to deliver quality content every time. Having said that, there is a proper procedure to follow when developing your content writing ideas so that the search engines (SE's) will be able to identify and categorize your information and know when to present it to the relevant searchers. This is what makes Sitesell's Solo Build It so great, in my opinion. They not only provide all the tools I need to create successful business websites, they help me stay relevant to the search engines. You as site owner - You must win, too, of course. How? If you are adding value to the internet marketplace you will succeed as well. Provide simple, original, and uniquely your own, valuable info, and the search engines will treat you right. As humans respond positively to your site, the SE's will reward you with higher and higher rankings. Everyone wins! Your merchant partners - For example, let's say that you plan to participate in the Google AdSense program. By focusing each page clearly on one topic, Google will be able to deliver contextually relevant ads. That makes Google's advertisers happy. You have to also think about and satisfy your affiliate partners. They want sales. The best way to deliver them is through top content that gains your visitors' confidence. Gently presell and use "in-context" text links to recommend and direct those visitors to places that you believe deliver superb products with great value. Do not reproduce third party articles on your site. Google may hold you responsible for duplicating material and breaching copyright. At the very least, you will fail to gain ranking in the search results, which means the time you spent copying rather than writing article content was a complete waste. Remember the lines of responsibility. You are held directly responsible for what is on your site. Attract free traffic through the Search Engines, targeted visitors who.. Generate income for you through a variety of monetization models like clicking on your Google ads clicking on affiliate links or buying your service or products from your website shop. Content is king and is always the beginning of the CTPM Process!